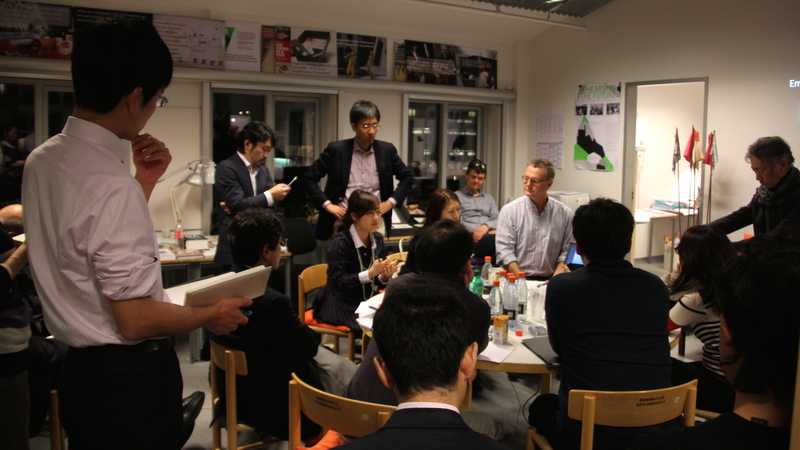 Last Friday CODE received an impressive group of 18 visitors from the Japan Innovation Network and the Future Centers Study Group, as well as Thomas Hammer of Copenhagen Living Lab, and Hank Kune from Educore. The delegation, led by Professor Konno and Mr Nishiguchi of the Japan Innovation Network, was seeking inspiration from how CODE’s approach to co-design can support social and societal innovation in Denmark and beyond. On top of a fruitful discussion about codesign, led by Thomas Binder, the evening was also a pleasant cultural exchange of Japanese and Danish ways of more or less casually working late on a Friday evening in our small studio. The Japanese participants span industry, government and universities and come from among other organizations the Ministry of Education, Culture, Sports, Science & Technology, Fujitsu, Daikin Industries, Kokuyo Furniture Company and Nikken Sekkei. The discussion propelled a shared international interest in the potential powers of collectives working together, and the delegation is now continuing their tour to other European knowledge institutions.